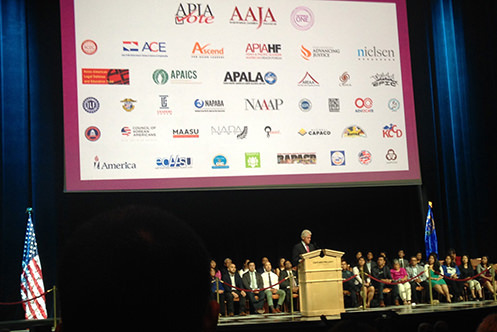 The best thing about last weekend’s Asian American Journalists Association convention in Las Vegas wasn’t necessarily the Presidential Election Forum, co-presented with APIAVote. Oh, yeah, President Bill Clinton showed up. He’s running for First Grandpa. More on him later in this column. But no one else showed up who was actually running for the high office. Not unless you count Gary Johnson the Libertarian, who actually drew loud cheers when he admitted to getting high. He said he last used marijuana three months ago. Johnson was also asked what “AAPI” meant. I’m sure his campaign wasn’t happy that he was totally clueless. Was he suffering from cannabis deprivation? To hear him stumble on that question was disappointing. It’s a new level of AAPI invisibility when the semi-anonymous Libertarian candidate for president doesn’t even know us by our acronym. Oh well, at least the totally anonymous Green Party candidate Dr. Jill Stein was able to say what “AAPI” meant. But so what? She’s not the Bernie alternative. The real newsmaker would have been Republican standard disruptor Donald Trump, but he was a no-show. After his disparaging comments last week about wanting to vet Filipino immigrants more carefully for terrorism, The Donald showed just how little he cared for Filipino Americans, specifically, and Asian Americans, in general. His concern for us? Not even measurable. Just think, he could have shown up to help the Republican who wants to replace Nevada’s Harry Reid in the Senate. Trump just doesn’t care about anyone but himself. And to add insult to injury, Trump sent a surrogate, Utah’s Attorney General Sean Reyes, a Filipino American, to do his bidding. Reyes told jokes about cooking rice and eating spam in a pandering ploy to ingratiate himself. The crowd was polite. But Reyes didn’t touch the Trump headlines of the day. Trump’s Russian coziness? The non-release of his tax returns? The “sarcastic” comments that Obama was the “founder of ISIS? That veiled threat of assassination against Hillary Clinton? Maybe a hint of the new “extreme vetting” plan Trump wants to implement? Reyes did read off Trump’s positions from a fact sheet better than The Donald could have, showing what a semi-respectable Republican might sound like mimicking Trump. Of course, Reyes did comment on the Filipino statements. But it was a simple clarification. Not really an apology. 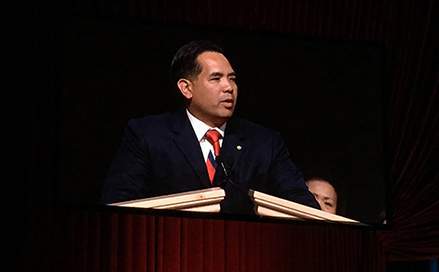 “Trump welcomes law abiding Filipinos,” Reyes said. Of course he does. We all do. No one is for illegal immigration. The problem is Trump’s divisive, inflammatory rhetoric that makes all Filipinos into suspected terrorists. And that’s about it. Reyes ended with another attempt to charm the crowd–most of which had emptied out by then. He did a rap song! He didn’t stay for questions. Given all that, for me, the highlight of the AAJA convention was the honoring of Lonnie Wong for lifetime achievement. He stayed put and covered your basic local news in Sacramento, California for 30 years. He’s not famous. But he does yeoman’s work and shows up every day at KTXL in Sacramento, an independent station that struggled along until FOX became a real fourth network. Thirty years in one place. In my news career, I’ve never been in one place more than eight years. Lonnie is a throwback. He’s a guy who hasn’t let his ego get in the way in the fake showbiz world of TV News. Throughout all the changes in media, he’s hung on, and reported the stories where he lived. You never hear Lonnie complain about not getting a shot at anchoring, or getting the big story. But he’s still there in Sacramento, and viewers notice. He’s part of the community he has covered for a long time. As an older veteran, he represents wisdom. That, unfortunately, isn’t what local media outlets are looking for these days. Too often, older reporters are shipped off, early-retired, or just fired. They’re replaced with younger, cheaper, less knowledgeable talent who look at a mid-market like Sacramento as the stop before the big time glamour markets of TV News. They’re journos out of touch with their communities. Out of touch with their ethnicity. Out only for themselves. 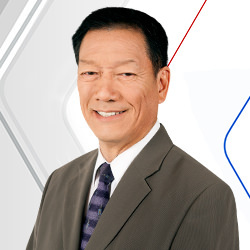 There’s a lot of that in the world of journalism these days, which makes the Lonnie Wong story a refreshing anomaly, worthy of an AAJA lifetime achievement award. Such an award for life experience connotes wisdom, something too often in short supply in media and politics. 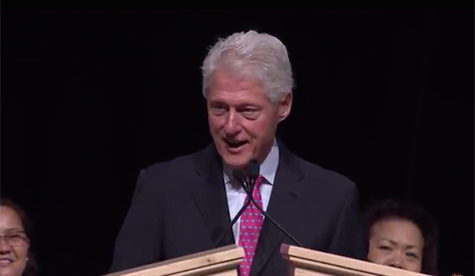 Enter President Bill Clinton at the presidential town hall in Las Vegas. Hillary sent Bill, and it was a good choice. He was the star of the entire event and got the loudest cheers. For many Asian Americans, Bill Clinton represents an historical sea change in politics when he won in 1992, ending a solid block of Republican leadership since Reagan in 1981. Seeing Clinton on the stage Friday reminded me of the time I covered the 1992 Democratic National Convention in New York. Back then, I recall how he talked about “unity and community” and bringing the country together. The same topics came up again this time, accompanied by a wise observation by Clinton of the state of American politics. “A democracy only really works when people talk to each other,” Clinton said. “When I think of my dream America in the 21st Century, it includes an inclusive society where we value our diversity and we make so much progress in the last several years. As a nation, we made so much progress in the last several years. We’re clearly less racist, sexist, homophobic than we used to be. Not withstanding some unfortunate incidents in this campaign, most Americans are not bigoted against other people because of their religion. Clinton said if you read the Constitution, it might well have been subtitled, “Let’s make a deal,” referring to all the different branches of government that are in play. These days, people don’t just like to argue. Politics has become a blood sport, where hate is a driver that divides and conquers. But look who has survived so far. On stump speech mode, he outlined Hillary’s familiar initiatives on small business loans, comprehensive immigration reform, and no-cost college plans. It was more of the “stronger together” rhetoric we’ve heard to date. But he ended his speech with the high stakes of this campaign and what a new Clinton era could bring. Clinton couldn’t get out of the room without one question on emails–not his, but Hillary’s. Trust is the No.1 thing people mention when they talk of their dislike for Hillary. Bill Clinton said there was a double standard for her versus other career diplomats, compounded by the fact that the State Department and security agencies had very different classification systems. “These things were never resolved,” Bill Clinton said. “It’s too complicated to explain to people, but basically, do you really believe there are 300 career diplomats–because that’s how many people were on these emails–all of them are careless with the national security? Do you believe that? Forget about Hillary. Forget about her, is that conceivable? If it were that important, shouldn’t we have all heard about that earlier? Bill Clinton said the email situation was simply not a cause for distrust. “If it were a cause for distrust, it is inconceivable that all these prominent national security people active in all these other administrations, including Republicans, would endorse her,” he said as the crowd applauded. Not sure if that satisfied Hillary haters. But Bill Clinton left the stage to cheers, the star of the show.